Afternoon, all! It's time for another segment of Ask Sentai! Thanks again for sending in your questions, we are trying to answer as many as possible every week. As always please keep sending in your queries to our ask.fm account and maybe we will answer yours! Well, we are packing in TONS of extras on the disc, actually! We shot a lot...a LOT, of footage with Jessica, and put the juiciest bits in our release. They're pretty funny, we hope you enjoy them! Right now, no. For the English reveal trailer, we actually gathered a few people from the office to be reporters. We had a male and female English speaker, a Spanish speaker and someone who spoke Vietnamese. Are you going to license Little Busters EX? We are on the hunt for it! Cross your fingers! We never said it wouldn't be dubbed! And for the record I wholeheartedly agree with you. We have a general release date set for BtB, yes. Unfortunately we aren't ready to announce it just yet. We've already released K-ON! Season 1 on DVD, and hopefully a Blu-ray release should be coming soon. Is there any possibility that your subtitles will be black, rather than yellow? I love your releases, but the yellow text kind of takes away from the experience for me. "We use yellow subtitles for better readability against any color on screen. If the background is white, such as snow, clouds, walls or shirts the subtitles will be more difficult to read in the time it is on screen. Also due to the DVD spec we are limited to using only four colors at a time: yellow, white, black and grey. We use yellow as the primary, white as the secondary and captions, black for the subtitle border and grey is a transparent background. This is carried over to the other formats. We are starting to use colors in captions for BD and streaming but it has to be processed manually for each caption and the primary dialogue will remain yellow." Do you guys have any more license announcements during Anime Matsuri con? I really hope you guys license Kancolle, Hanayamata, When Supernatural Battles Became Commonplace, Isuca, World Trigger, The Testament of Sister New Devil, and a bunch of spring season anime titles. Yes, we will have quite a few announcements at Anime Matsuri, stay tuned! Nyan-pasu!, Mr. Sentai Social Media Guy. Will Sentai fulfill my hopes and dreams by picking up Non Non Biyori Repeat when the summer season rolls around? Any news about Akame Ga Kill? Right now there's not much. We have, however, started talking about it internally, so hopefully some news will roll out soon! I really cant say about a collector's edition, but I CAN tell you that we have received the UNCUT and UNCENSORED versions of the series, so there's that to look forward to! 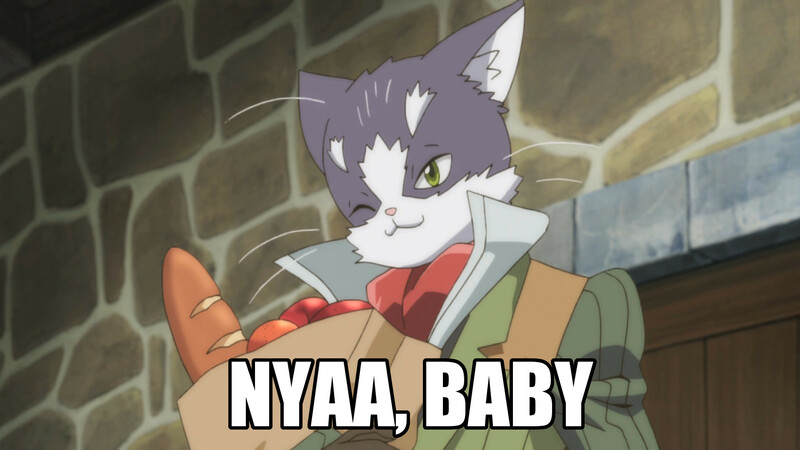 Who would win in the ultimate man-cat fight: Chaser John Doe from Dream Eater Merry vs. Nyanta from Log Horizon? When you pick up (insert title here) why do you immediately solicit for the month releases? This only really happens for catalog titles (those titles that are not simulcasts here in the US), and usually it is because we want to make extra sure that we are able to release it in a timely manner without delay for you guys.